Han Solo – Imperial Cade #3 opens with Han peeling some kind of alien potato. Whatever it is, it’s messy, because he has a hard time getting the stains off his face. 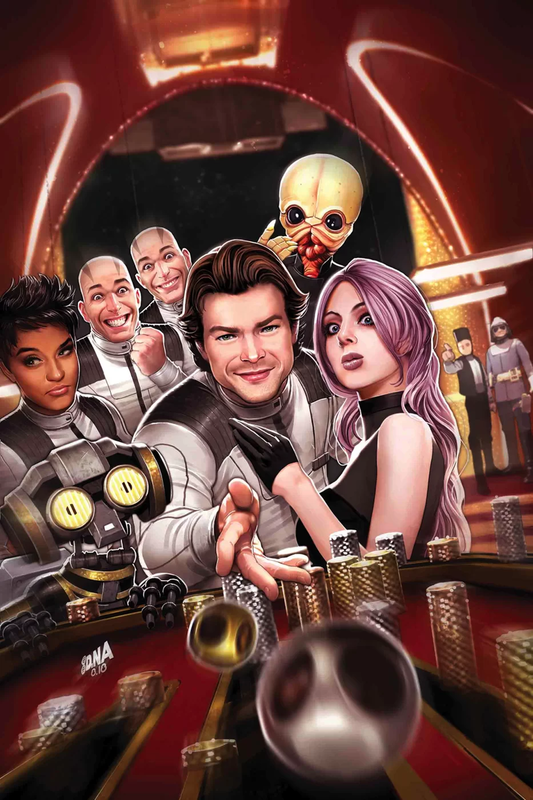 When not peeling alien potatoes that attack him, he pulls off some minor thievery to get everyone a trip on a mobile gambling ship. Picture Las Vegas in space. One of the cadets even gets married. But the whole convoluted story is just a way so Han can find out if Qi’ra is still alive and on Corellia. The question is, is it worth it? I haven’t been too satisfied with this series so far. Rather than getting an insightful glance into Han’s stint in the Imperial Academy, we’ve gotten some throw away issues of Han blowing off the Empire and training. This issue doesn’t do much on it’s own other than showing when Han applies himself, he can do great things, but the things he applies himself to don’t further his career in the Empire any. The heart of the problem is the series doesn’t seem to be digging deep into the character. We’re not seeing Han learning anything that would help make him a better pilot. We’re not seeing him doing anything remarkable as an Imperial. And we’re not seeing him come to some realization of how awful the Empire is. To be honest, he doesn’t seem to care about anything, and as a reader, I’m not compelled to care about series. This issue isn’t any different. Beyond the writing, the artwork is okay. It’s cartoonish, but there’s some detail to it. There’s a couple panels that are interesting, but it doesn’t raise the bar and it’s not in the running for best artwork in a Star Wars comic. It simply gets the job done. With okay artwork and a story that isn’t all that interesting, Imperial Cadet #3 is a forgettable comic. The most interesting things have nothing to do with Han. While people might remember the weird alien potatoes or the guy getting married to an alien while enjoying his day pass, you’re not likely to remember anything else in a couple years. As is, I give this issue a two and a half out of five metal bikinis.